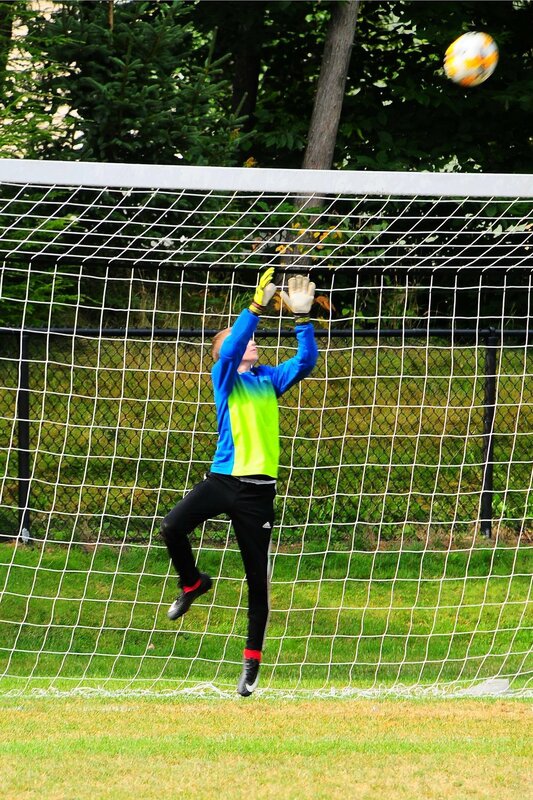 The October 11th PHOTO OF THE WEEK is a tribute to one of our many goalies that do their best to seal off the goal to the other team, often throwing their bodies at the feet of the opposing teams to keep the ball from scoring. Using their instincts to anticipate the shot, when to go out, when to track back, and when to throw their whole body into the air towards the ball to not let it breech the space behind them, not let it cross that white line. And some, like the one here, Evan Donnell, also get the chance to come out of the goal and join their teammates on the field, often with a heightened drive to see the ball go in the opposing net. With AFFC U13 team down 1-0 with 10 minutes left in their game versus Yarmouth this past weekend in Sanford, Evan left the goal he fought all game to protect and went on to score the game tying goal with 6 minutes remaining. But he didn't stop there, he went on to score the game winning goal with less than 1 minute left. Congrats to Evan and kudos to all our special goalies!! - Photo courtesy of Keri Hayes!